A mystery big cat animal has been spotted in a field on the outskirts of Dorchester. Mark Dawson said he is 'absolutely 100 per cent sure' that the animal he saw standing in a field near Dorchester football stadium was a panther. ....other people have claimed to see panther-type animals in the area. Last year Marjorie Nicholson, of Talbothays Road in Dorchester, told how she saw a panther walking in her road early one morning and watched it walk off towards St Osmund's Middle School. And farmers have reported finding dead livestock showing wounds consistent with a big cat attack. “Oh, you haven’t got much money to live on at the moment? Well, how much income did you have last year – I’ll divide that by 52 and pretend that’s how much you’re getting this year, then if it’s less than I think you need I’ll top it up this year with weekly payments. “But if you end up having had more coming in this year than you did last year, I’ll work out how much extra you’ve had coming in that you shouldn’t have had, and ask you for it back as a lump sum (even if you’ve spent it already). "Self discipline is the key. You can’t force a child to become anti-social. It’s all a matter or respect. "Let a child use his or her intelligence creatively, then they’ll respect you and the world around them. "Once you frustrate creative intelligence, you end up with an angry, impotent and anti social society." - from Agatha Christie's 'They Do It With Mirrors'. It might be old-fashioned, but that doesn't mean it isn't true. The education system in this country stifles children, making them all work at the speed of the slowest, not encouraging those with talent to develop it, you can't win at games etc. And look at what we've got. You can't blame the parents alone, they were brought up in the same system. We've had about 25 years of all this, plus the Politically Correct lobby that basically said "Throw away all the old ways". It's time to get things sorted. Start with the politicians who deny that there's anything wrong. When a child is murdered by another child, they start quoting statistics and say "It's not all children." NO, but look at society and bring back PROPER EDUCATION, bring back APPRENTICES, help children to be good at something creative. Never mind about the Great White. 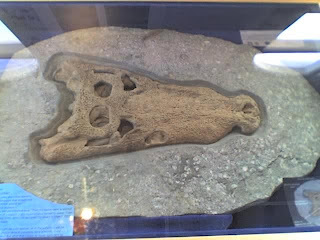 We have our own crocodile: found in Swanage, fossilised head on display at Heritage Centre. I've been asked to find a pianist or somebody to accompany a good old singalong. Any takers? Or do you know somebody who can do this? Please contact me on 01929 422338. The incidence of pavement parking in Swanage continues. I've just seen a disabled buggy driver on the pavement in De Moulham Road have to reverse down a hill because someone had parked their car across the pavement pointing at their drive! The local free sheet weekly continues, it seems, its decline from any pretence of conveying anything as sordid as news.This week it splashes on its front page as the most vital news item of the seven days something about the post office in Swanage now being a jolly good place.Well, we know this, surely, we go there, and are aware that it is rather changed from the dark days when it was run by a Conservative town councillor.The secondmost important news of the week is yet more advertising for the Monkey World attraction.When is someone going to produce a local publication which has news?There is, surely, enough of it about.Not least in and around the Town Council. Sentinel asks: We hear a lot about Human RIGHTS, but what about Human RESPONSIBILITIES? The BBC reports that 5 police staff have been disciplined for failing to care for a drunk man who died after being left in a cell for 10 hours. In summary the report is that Tony Davis, a well-known heavy drinker in Swanage, Dorset, was arrested on the town's seafront on 12 October, 2004. He was taken to Poole police station and later found lying on the floor of his cell without a blanket and was taken to hospital after a police surgeon was called in and failed to detect a temperature and died of hyopethermia. A police custody inspector was fined 13 days' pay, the maximum possible under police regulations, for neglect in the performance of his duties. Two male custody sergeants were found guilty of neglect in the performance of their duties. One of them was reprimanded and the other is to be issued with a written warning. Two male civilian police staff detention officers were found guilty of gross misconduct and were each given a final written warning regarding the performance of their duties. A third male civilian police staff detention officer resigned from his post before a disciplinary hearing was held. This disgusted me! And I quote! I would point out that many of those Blue badge holders are those that during WW2, were the ones that made the sacrifices for all that you the people enjoy today. The fraudulent use of the blue badge in Swanage, is of such a rate to be a local scandle. So the jet's at it again today. I've spoken with MOD - they say not one of theirs. Bournemouth Airport are investigating, and will come back to me. Have also spoken to Civil Aviation Authority who will investigate and come back to me. I'll let you know what they say. There's more Live Music on the seafront this week. The main carnival stage is still up with all the big speakers, and there are different bands on each evening. I had a great time last night (Monday) with the Martin Johnson Band, featuring saxophone, guitar, bass, drums, Steve who runs the blues festivals on piano, and Martin himself of course singing. It's well worth a stroll down there from about 8pm onwards. Mike Dimarco has the details of who's playing on a board in front of the sound hut in between the amusement arcade and the Fishermans Catch. When the Order comes into operation on 6 August 2007 it will be on an experimental basis and be in force for a maximum period of 18 months. The effect will be to vary “The County of Dorset (Shore Road, Swanage) (Traffic Management) Order 1984 (Amendment) Order 1987 such that the prohibition of vehicles in Shore Road from the northern side of its junction with the service road to the Mowlem to its junction with Victoria Avenue will apply between 1 May and 30 September for 24 hours a day. Main Reception, Dorset County Council, County Hall, Colliton Park, Dorchester, and Purbeck District Council, Westport House. Worgret Road. Wareham and Swanage Town Council, Town Hall, Swanage. For technical queries please contact Swanage Town Council on (01929) 423636. For other queries please contact Denise Thorner on (01305) 221709. The County Council will be considering in due course whether the provisions of this Order should be made permanent and any person who wishes to make any observations, whether supportive or in objection to the making of a permanent Order, may do so within a period of six months from 6 August 2007 (or if this Order is subsequently varied or modified by another Order, within six months of that Order coming into operation). Any such observations should be made in writing to the Swanage Town Council, and any objections must specify, the grounds on which they are made. So from the 6th of August the seafront between Station Road and Victoria Avenue will be closed to all traffic! How will the delivery lorries for the TIC,and other shops be able to deliver their goods if the road is closed between May and September ?